Iraq's most influential Shia leader, Grand Ayatollah Ali Sistani, is in a stable condition after undergoing a heart operation in London. 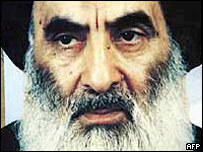 The ayatollah's London office said the 73-year-old cleric had an angioplasty procedure to unblock a coronary artery. He had flown into London on 6 August for treatment at the world-renowned Harefield heart hospital. On Thursday the ayatollah expressed "deep sorrow" at the violence in his home town, the holy city of Najaf. US and Iraqi troops have been fighting militias loyal to young Shia cleric Moqtada Sadr for more than a week. Ayatollah Sistani's London office said on Friday: "There were no adverse side effects during this operation and his health is currently stable." The ayatollah, who is the prime marja, or spiritual reference, for Shia Muslims, is one of only five living grand ayatollahs. The UK Foreign Office has said there was no political aspect to the trip, but that it had helped out with the logistical elements like visas.